From Jodi Thomas…Callie has done a lot of crazy things, but it’ll take one more to prove she isn’t nuts: find a husband, fast! Her only requirement: he has to be taller than she is and swear not to have her committed during their ruse of a marriage. From Jo Goodman…Felicity Ravenwood was raised to be independent-minded, but when this runaway bride opposes her father’s choices, it is up to Nat Church to bring her around. But he doesn’t count on springing her from jail, holding her hostage, or falling head over boot-heels in love. From Kaki Warner…Two strangers on a train have more in common than they know—both have hidden purposes and ties to a Nebraska bank robbery. But when their schemes unravel, they find a bigger surprise awaiting them than either could have imagined. From Alison Kent…When runaway New York socialite Maeve Daugherty joins her father’s bodyguard Zeb Crow on his personal mission of revenge, what was a slightly scandalous new life as a bookkeeper for an infamous San Antonio brothel becomes downright dangerous. But that’s not stopping Maeve from having the time of her life. I requested this anthology because I have read and enjoyed three of the four authors before. It also helped that this was a western one of my favorites of the romance sub-genres. “Crazy Callie” by Jodi Thomas was a sweet novella. It reminded me of a Louis L’amour western with an emphasis on sweet romance. Callie desperately needed a husband so she found a man who lived for three years on the promise of a dream only to have it snatched away from him. Together they decided to make the best of it and along the way fell in love. While the bad guy didn’t get what was coming to him in terms of retaliation or punishment, I thought how the final confrontation was handled spoke volumes for the essence of Callie and Luke and what they wanted to build their life on. “Nat Church and the Runaway Bride” by Jo Goodman is a novella about a character whose exploits are the subject of dime store novels mentioned in Goodman’s western novels. I have enjoyed the technique of an author writing the story of a character who is fictional to their main characters in the past and this was no exception. The forced interaction between Nat and Felicity was very entertaining as they learned about each other. Felicity’s strength of will remained evident and Nat never crushed her drive or independent spirit. I loved how they figured out their feelings and how to remain independent from her father. “The Scent of Roses” by Kaki Warner was my introduction to Warner. I found it full of secrets, hidden agendas, verbal missteps, and card games. I enjoyed the cat and mouse game with the main characters trying to figure out who their traveling companions really were. Warner kept me wondering about the possibility of multiple criminals all with the same goal in mind, which made me speculate until the very end. I did guess who might have done it in the story but Warner made the confrontation quite exciting. 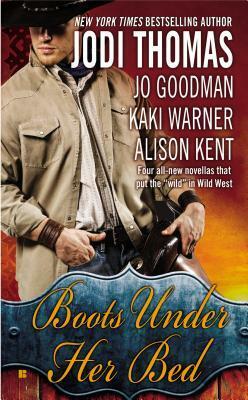 “The Hired Gun’s Heiress” by Alison Kent was probably my favorite in this anthology. The contrast between sheltered Maeve working out of her comfortable environment and the hard certainly not sheltered Zeb was very entertaining. Zeb and Maeve had never really talked except for one evening when Maeve got drunk and started asking Zeb questions that she had wondered for years but never asked. She was resistant to leaving her job but on the journey continued to pry at Zeb out of curiosity and frustration. I loved how Kent built the sexual tension and thought this line by Zeb after Maeve stopped their first actual kiss was hilarious. “Because I’m going to be busy awhile putting out my own flame. I sure as hell don’t have time dealing with yours.” I also really liked how it took Maeve’s quick thinking and Zeb’s knowledge of betrayal among criminals to get out of an ugly situation. Overall this was a better than usual anthology because even though I had not read all of the authors previously, I enjoyed all four stories to varying degrees. One theme that I found consistent is the desire to live a happy relatively peaceful life together without the need to wreck ultimate vengeance against those who could have been considered the ultimate bad guys.